Dairy Queen offers a comprehensive guide to allergens in its foods, which makes it easier for those with food allergies to see what we might be able to enjoy there. Be aware that—as with any fast food restaurant—the risk of cross-contamination can be significant no matter what you order. Talk to a manager or a supervisor before ordering at Dairy Queen (or anywhere, for that matter). You also always should check current ingredients lists, since the ingredients used can change at any time. Here's the allergy-by-allergy guide to what you can order at Dairy Queen if you have food allergies. Those who are allergic to egg should be able to find plenty to eat at Dairy Queen. The vast majority of the chain's shakes and malts are egg-free, and many of its ice cream concoctions are safe, as well. Be aware that Dairy Queen uses egg ingredients in several of its ice creams (since flavors can change, double-check ingredients at the location). There also are egg ingredients in Dairy Queen waffles, waffle cones (regular cones are safe), and in numerous burger and chicken sandwich options, including both fried and grilled foods. For example, the Honey Glazed Chicken Strips contain egg. However, there are some sandwiches and salads that are egg-free: the 1/3 lb. Double with Cheese is egg-free, as is the Cheeseburger and the KC BBQ Bacon Cheeseburger. Dairy Queen serves both fried fish sandwiches and fried shrimp in a basket. According to the chain's allergy statement, these foods are cooked in a fryer shared with other fried foods, including chicken and french fries. Therefore, if you're allergic to fish and/or shellfish, you should avoid the sandwiches and baskets containing those items, and if your allergy is severe you also should skip anything fried. To stay completely safe, stick with the ice cream-based items, which are free from fish and shellfish ingredients. Although Dairy Queen by its very nature isn't ideal for someone with a milk allergy (to put it mildly), you don't need to go hungry if the chain is your only choice. You'll need to avoid all the ice cream and all the premium smoothies, but the Papaya Paradise Light Smoothies on the menu are milk-free (be sure to double-check, as ingredients can change, and be aware of potential cross-contamination problems). You also can order chicken strips or a chicken garden greens salad, and the hot dogs are milk-free if you don't buy the ones with cheese. Fries are milk-free too, although be aware they're cooked in a shared fryer. Dairy Queen does use peanut ingredients in a few foods, most notably in some of its Blizzard treats, its peanut butter shake, its parfait, and its peanut butter sundae. So there's certainly a risk of cross-contamination in most frozen items, even if they don't contain peanuts. The chain's hot foods are peanut-free (but always double-check). If your ​peanut allergy is severe but you decide to order ice cream, talk to the manager about using clean utensils and mixers to prepare your order, and ask for the manager to obtain your ice cream from an unopened container. The chain uses coconut and other tree nuts, such as pecans, in several shakes and Blizzards. In addition, Dairy Queen notes a cross-contamination risk for tree nuts on most of its peanut-containing products. The chain's hot foods are tree nut-free, and many ice cream flavors also are free of tree nuts. As with peanuts, if your tree nut allergy is severe but you want ice cream, make sure the staff uses clean utensils, and ask for them to take the ice cream from a new container. According to Dairy Queen, its frying oil is a vegetable oil blend that includes soybean oil. "While soybean oil is not recognized as an allergen, consult your doctor as to whether you should avoid soybean oil," the chain's allergen statement says. All of Dairy Queen's ice cream cones contain soy, its frozen blended coffees all contain soy, and all of its shakes and malts contain soy. In addition, almost every hot food item and most Blizzards come with a soy warning. If you're allergic to soy, you may be limited to soft drinks and a side salad at Dairy Queen, although if your allergy isn't severe you may opt to try one of the few non-soy-containing frozen treats. Wheat appears in some ice creams and shakes and in most hot foods at Dairy Queen. The premium and light smoothies should be safe, as are the Julius Originals. You also can order a salad with grilled chicken (not fried). The french fries are wheat-free but may be cooked in a shared fryer with wheat-coated items. Also, be aware that all of the malted shakes are listed as containing wheat ingredients. 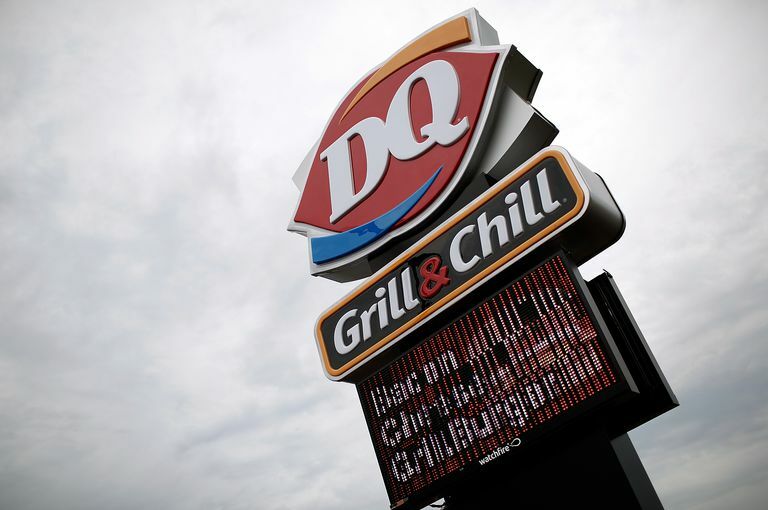 It's possible for people with food allergies to eat at Dairy Queen, as long as they steer clear of foods that contain their allergen and alert the staff to potential cross-contamination issues. If you need more information on ordering at Dairy Queen, you can read Dairy Queen's chart containing allergen and nutrition information on all of its products. Use the chain's online contact form for specific questions about allergens or menu items. Food Allergy Research & Education. Dining Out fact sheet. What Can You Order at P. F. Changs If You Have Food Allergies? What Can You Eat at Chipotle When You Have Food Allergies? Which Medicines Should Be Avoided In People With a Food Allergy?